NAPLES, ME (January 12) – After two seasons of competing in a partial Pro All Stars Series (PASS) Super Late Model schedule, Newmarket, NH driver Bryan Kruczek is ready to make the next step in his racing career. Kruczek will compete full-time in 2015 and hopes to contend for the new PASS Northeast Super Late Model Challenge. Unlike the overall PASS North Super Late Model series, the PASS Northeast Super Late Model Challenge will allow drivers to compete for a separate title in the United States events only. For Kruczek, 2015 presented the perfect opportunity to race for his first PASS title. “I feel like we are making a huge step in our program this year and look forward to stepping out of the shadows in 2015,” said Kruczek of his new opportunity. Waterbury, VT –Two of the leading short track sanctioning bodies in the United States and Canada, the American Canadian Tour (ACT) located in Waterbury, VT and the Pro All Star Series (PASS) from Naples, Maine have reached an agreement entering the 2015 season. The first ever “double-header” event to be held between the two groups will take place at the opening event for the 2015 PASS season at the Oxford Plains Speedway(OPS), Oxford, ME on Saturday, April 18, 2015. Both the ACT Late Models and the PASS Super Late Models will compete in 150-lap feature events to open the race season at the historic Oxford Plains Speedway. ACT has a traditional opening day event at the Lee USA Speedway with the annual New Hampshire Governor’s Cup race on Sunday, April 12, 2015. (Halifax, NS, August 20, 2014) The Parts for Trucks Pro Stock Tour is headed to Petty International Raceway this Saturday for the Atlantic Dodge Dealers 150. This is the third and final trip of the season to the ¼ mile oval located just outside of Moncton in River Glade, NB. 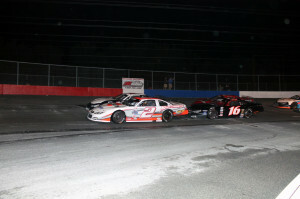 The 150-lap stock car event marks round ten of 12 for the popular regional touring series. The Atlantic Dodge Dealers 150 is the highlight event of the 50th running of the River Glade International taking place this weekend at Petty Raceway. Grandstands for Saturday’s main event open at 3:00 PM, qualifying will take place at 5:10 PM with Atlantic Tiltload Time Trials. Feature racing is slated for 6:00 PM. (Fredericton, NB, July 12, 2014) Shawn Turple (Enfield, NS) won his second race of the Parts for Trucks Pro Stock Tour season Saturday night at Speedway 660 in Geary, New Brunswick. Turple, a two-time series champion, inherited the lead on Lap 72 when then leader Shawn Tucker (Fredericton, NB) was relegated to the back of the field after jumping his third restart of the caution filled race. Tucker managed to make his way back to finish third behind John Flemming (Halifax, NS), who also came from the back of the field after a flat tire forced him to pit in the first half of the event. Dylan Blenkhorn (Truro, NS) and Jonathan Hicken (Brudenell, PE) dodged a last lap melee in turn three to take the fourth and fifth place spots at the finish. To start the day, Blenkhorn became a four- time Atlantic Tiltload Time Trial Winner after a quick 13.635 second lap. It was Flemming that earned the right to start the Main Feature on the pole after crossing the line first in the King Freight Dash For Cash. Two exciting Dartmouth Dodge Heat Races determined the starting positions for the remainder of the field which saw Darren MacKinnon (Charlottetown, PE) best Turple on a last lap pass and Dave O’Blenis (Boundary Creek, NB) win a three wide battle to the checkers over Matt Harris (Fredericton Junction, NB) and Cole Butcher (Porter’s Lake, NS). Tucker led 51 laps to take home the Linde Most Laps Led Award. Turple improved his starting position by 8 spots to take the Exide Batteries Hard Charger Award. (Halifax, NS, June 16, 2014) The Parts for Trucks Pro Stock Tour heads to the tight, 3/10-mile Scotia Speedworld oval, located just outside of Halifax, Nova Scotia for the Lockhart Truck Center 150 this Saturday, June 21st. The Lockhart Truck Center 150 marks the second of four stops at Scotia Speedworld on the 2014 schedule and round three of 12 for the popular stock car racing series. Grandstand gates for the Lockhart Truck Center 150 open at 3:00 PM; Atlantic Tiltload Time Trials will get underway at 5:10 PM with racing slated for 6:00 PM. The Parts for Trucks Pro Stock Tour was slated to run the Ron MacGillivray Chevrolet Buick GMC 150 at Riverside International Speedway last weekend but got washed out by two days of wet weather. The championship points picture remains unchanged following the Irving Oil Blending & Packaging 100 which ran on May 31st. Current series champion John Flemming (Halifax, NS) sits atop the standings, followed by our most recent race winner Jonathan Hicken (Brudenell, PE). Shawn Turple (Enfield, NS), Cole Butcher (Porter’s Lake, NS) and Shawn Tucker (Fredericton, NB) round out the top five respectively.